The Most Venerable Kyabje Bokar Rinpoche, lineage Master of both the Shangpa and Karma Kagyu, was born in western Tíbet, in 1940 (Iron Dragon year) to a family of nomadic herders. When Rinpoche was four years old, he was recognized as the reincarnation of the previous Bokar Tulku, Karma Sherab Ösel and named Karma Shedrup Yongdu Pel Zangpo by HH 16th Gyalwa Karmapa. Rinpoche was trained at the monastery founded by the previous Bokar incarnation. He continued his studies at Tsurphu Monastery in central Tíbet, main seat of the Karmapas. While still a teenager, he assumed full responsibilities for the Bokar monastic community. Then, at the age of 20, he went to India and became a close disciple of Dorje Chang Kalu Rinpoche. Under Dorje Chang Kalu Rinpoche's guidance in Sonada, Kyabje Bokar Rinpoche completed the traditional three-year retreat twice. During the first one, he studied and trained on the practices of the 6 Yogas of Niguma of the Shangpa Kagyu; the second was based on the practices of the 6 Yogas of Naropa of the Karma Kagyu. Kyabje Bokar Rinpoche was considered to be Dorje Chang Kalu Rinpoche’s spiritual successor. He benevolently taught the Dharma to the monasteries around Darjeeling as well as Sikkim. 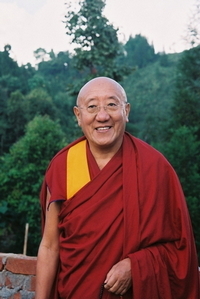 Kyabje Bokar Rinpoche was one of the main meditation teachers of the Kagyu. He had meditated in strict retreat for over 19 years. He had been appointed by the 16th Gyalwa Karmapa to be the retreat master of a new retreat Center at Rumtek Monastery in Sikkim, a position which he upheld for more than 13 years with utmost integrity, dignity and a deep sense of responsibility. In 1986, Rinpoche founded a monastery named Bokar Ngedon Chokhor Ling at Mirik, a village in the hills of Darjeeling, where the 11th century Mahasiddha Maitripa, one of Marpa's teachers, had done retreat. Later Rinpoche also established retreat Centers near the Monastery for the practice of the Kalacakra, the 6 Yogas of Naropa of the Karma Kagyu tradition and the 6 Yogas of Niguma of the Shangpa Kagyu tradition. Kyabje Bokar Rinpoche passed into Parinirvana at 8:50 am on Tuesday, 17th Aug. 2004.